Boracay, a Philippines island paradise located in Malay, Aklan, Western Visayas, has the best white sand beaches, sparkling turquoise ocean water, memorable nightlife, water sports, shopping, astonishing sunset view, captivating scenery etc. Dubbed as the Best Overall Island in the World in 2012 by Travel + Leisure Magazine, Boracay Island continues to provide an awesome and unforgettable fun for everyone. #1 - Surfside Boracay Resort & Spa: A little piece of heaven on White Beach, Angol Point Station 3, Manoc-manoc, Aklan Province -- that is no other than Surfside Boracay Resort & Spa. You can look forward to their very helpful and friendly staff, soothing massages, very clean and spacious rooms, good Wifi, affordable but delicious food, a relaxing hammock -- all provided for you in a most romantic, quiet spot in Boracay, that is just about 10 minutes walk towards Station 2. #2 - The District Boracay: If staying over at The District Boracay is a dream, you wouldn't want to wake up. Get loads of satisfaction from this stunning resort that is situated at Station 2, Balabag, Aklan Province. Their location is great, with easy access to D'mall, White Beach, bars, restaurants, etc. Enjoy their very welcoming and efficient staff, too, along with a superb breakfast buffet, clean rooms, roof top bar, and so on; it would be indeed hard to find anything wrong with The District Boracay. Two thumbs up! #3 - Jony's Beach Resort: It's about time for making more golden memories with your loved ones at Jony's Beach Resort -- your lucky treat at Balabag, Aklan Province. Feel at home with their outstanding staff, well-furnished and tidy rooms, amazing cable TV, huge as well as yummy breakfast, plus never miss trying out their best fruit shakes -- oh so heavenly! But wait, there's more! You can also book for their water sports and island hopping tour, which promise to delight you without breaking your budget. #4 - Shangri-La's Boracay Resort & Spa: You'll never forget and regret a wonderful stay at Shangri-La's Boracay Resort & Spa -- brightly shining at Barangay Yapak, Aklan Province. Their amazing staff, amenities, food, water activities, delectable buffet, child-friendly, shallow ocean water, big playroom for kids, marvelous pool, and many more -- will all truly take your breath away! 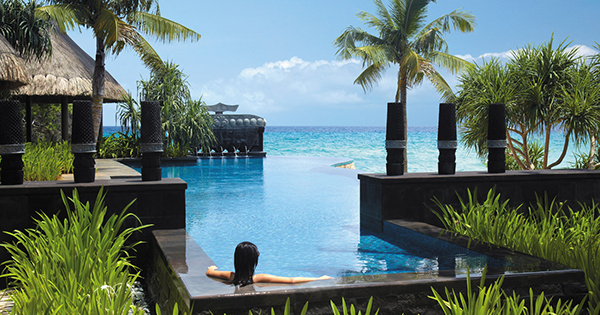 A South Korean guest, even commented that a vacation at Shangri-La's Boracay Resort & Spa is comparable with that in the Maldives -- a sovereign island country in the Indian Ocean, also known for its rich marine life and robust tourism. #5 - Agos Boracay Rooms + Beds: Rock your holidays right, with great enjoyment from Agos Boracay Rooms + Beds -- that occupies Main Road, Station 2, Aklan Province. For a very reasonable price, you can avail of their ultra clean a/c rooms, complete with all the essentials, daily replenishments of coffee, water bottles, etc., sun deck on the fourth floor where you can chill; in addition to their healthy breakfast, and extremely kind, warm staff as well as owners.